The Santa to the Sea Half Marathon & 5k Run is a large and well supported race held in Oxnard, CA. Founded in 2008, the race kicks off at the big Santa Claus statue just off 101s and cuts a path through Oxnard toward the Sea. This is the first race that really inspired Everybody’s Hungry founder, Jason Hendrick, to begin running distance races back in ’11. One of the best draws about Santa to the Sea is not the super fast and flat course, but rather the impact to the surrounding community. With the help of participants, volunteers and donations, Santa to the Sea provides a memorable Christmas for many youth with their toy giveaway, as well as supporting Boys & Girls Club, United Way and EBH partner, FOOD Share of Ventura County. The race shows great support for the community, and the community shows great support for the race. Many runners dress in costume and share holiday spirit. Everyone comes together and participation shows the success. Each year the race attendance and excitement grows, with 2013 being no different. Over 3,000 racers pounded the pavement. Team FOOD Share/Everybody’s Hungry Racing had approximately 30 runners representing, with 12 races sporting team shirts. Many of the competitors came away with personal records in a half marathon distance. As if that wasn’t enough to be proud about, the group also raised almost $2,000 in support of FOOD Share’s efforts in the fight against hunger. If you happen to be passing through Ventura County at the beginning of December or are visiting family in the area, consider Santa to the Sea as a fun run or family activity. We may not get any snow for Christmas, but we definitely catch the spirit. 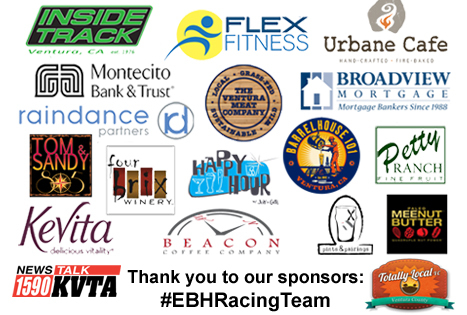 Gallery | This entry was posted in EBH Racing and tagged 2013 Running, EBH Racing Team, FOOD Share, Running, Santa to the Sea. Bookmark the permalink.